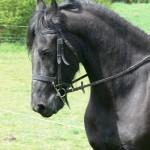 Wilbert RIP was our most experienced horse: 13 years old and standing at 16.1 hands. He joined us as an unbroken three year old in 2002. With the capable help of Tjeuke (RIP), his stable mate, we introduced him to carriage driving. Wilbert is a bit cheeky and has never quite grown up but he loves the carriage work, particularly as one of a pair. 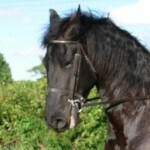 Maxi (aka Maxima R) Arrived in 2011 as a 7 year old mare. She in fact has become our star horse. 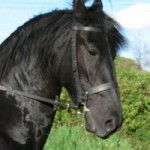 Stunning classic Friesian looks with luxurious manes and high actioned paces to match. On top of that she is very placid and an ideal pairs mate for Wilbert. Maxi stands at 16hh. 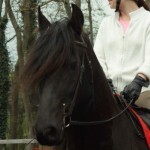 She is good under the saddle but difficult to ride for inexperienced riders due to her extremely bouncy gaits. Falko is a 10 yo gelding. He arrived in March 2008. Is now comfortable in the carriage with WIlbert. We are typically using him for pleasure drives around Newdigate or Capel. Falko, at 15’3, is slightly smaller than Maxi and Wilbert but is able to match them in walk so an ideal pairs mate for both. Esme (aka Lieneke T) arrived four years ago to replace Tjeuke as an unbroken three year old. She is 16 hands and is very affectionate, but can still be quite a handful when ridden. She is currently out on loan as she hasn’t taken to carriage driving at all. Driver and groom deserve a mention here too. Dineke as Coach(wo)man and husband Dik who grooms but is licensed to drive if necessary.